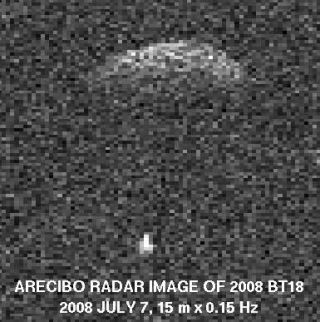 The asteroid 2008 BT18 is revealed to be a pair in this July 7 radar image. The larger object at top is thought to be spheroidal in shape. The shape of the smaller object (bright dot near bottom) is not known. A good-sized asteroid sailing past our planet right now turns out to be two giant rocks doing a celestial jig. The setup, catalogued as 2008 BT18, was thought to be nearly a half-mile wide after its discovery by MIT's LINEAR search program in January. Nothing else was known about it. Now seen as two objects orbiting each other, the pair will be closest to Earth on July 14, at about 1.4 million miles (2 million kilometers) away. That's nearly six times as far from us as the moon. It will not strike the planet. But scientists want to learn more about binary asteroids because one day they might find one headed our way. Deflecting a binary off course could be considerably more challenging that altering the path of a single rock. Radar observations from the Arecibo Observatory in Puerto Rico on July 6 and 7 "clearly show two objects," said Lance Benner of NASA's Jet Propulsion Laboratory. The objects are estimated to be 1,970 feet (600 meters) and 650 feet (200 meters) in diameter. The larger one rotates upon its axis in 3 hours or less. Additional observations from NASA's Goldstone radar in the Mojave Desert in California are expected to reveal more about the density, shapes and orbit of the pair. Asteroids are often loose rubble piles rather than solid objects, and pairs are common. Scientists announced earlier this month that binaries can be created when energy from sunlight splits a loose asteroid in two. While most asteroids roam in a belt between Mars and Jupiter, some are kicked or drawn inward and cross our path around the sun. Some 15 percent of these near-Earth asteroids are binaries. But few come so close. Asteroid 2008 BT18 remains classified by NASA as "potentially hazardous" because its future orbits have not been fully determined. Asteroids are known to change course over time, and in fact one big boulder, named Apophis, will alter course significantly during a close Earth flyby in 2029. Earth's gravity will bend the rocks' trajectory around the sun. Depending on how that interaction plays out, Apophis has a minor chance of hitting the planet in 2036. Scientists expect the odds of impact to diminish or evaporate after the first flyby, however.